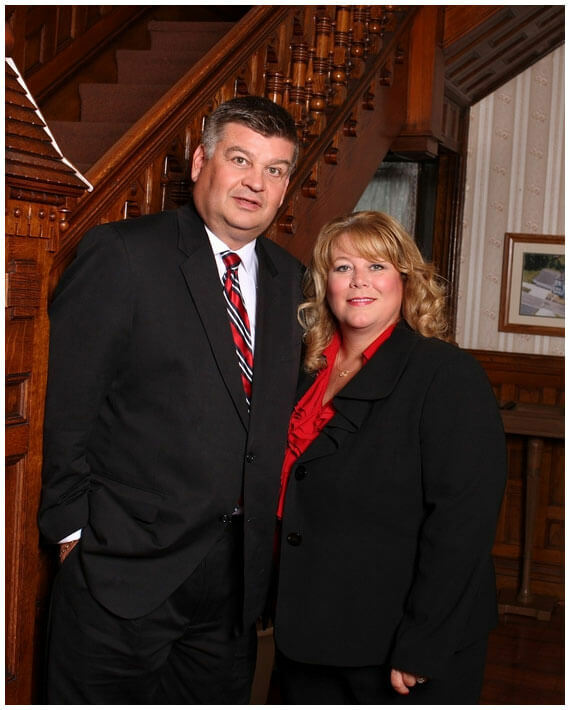 Mark and Becky Styninger began the Styninger family funeral homes in 1991 with the purchase of three small funeral homes near Mark's hometown in Central Illinois. The Styninger's operated these funeral homes along with a funeral home based paramedic ambulance service for 9 years. In 2000 they sold these homes and moved to Southern Illinois to raise their children and expand their family business. With over a quarter of a century of experience, the Styninger's are committed to the funeral profession and serving the ever changing needs of the community. Mark is a native of Lincoln, Illinois and graduated from Southern Illinois University at Carbondale in 1985 with a Bachelors degree in business along with an Associates degree in Mortuary Science. A licensed Funeral Director/Embalmer, he is very active in the day to day operations of the family business and serves as the Washington County Coroner. He is a member of the Egyptian Funeral Directors Association, the Illinois Coroner's and Medical Examiners Association and is active in the Hoyleton Lions club. Becky is from Mattoon, Illinois and studied music at Millikin University in Decatur, Illinois. She teaches piano and Kindermusik at her music studio located behind the Nashville funeral home and assists in the daily operations of the funeral business. Mark is a member of Trinity Lutheran Church and Becky is a member of Grace United Methodist Church in Nashville where she is pianist. They reside in Nashville along with their children; Brock (a Nashville Police Officer), Bryce and Bridget.